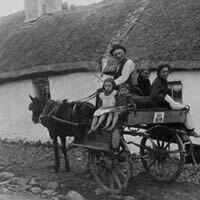 The aim of “Irish Emigrant Trails” is to help people gain a personal insight into their Irish ancestry. Tell us what you know about your family’s Irish ancestry in Ireland or anywhere else. It doesn’t matter if it’s a little or a lot – we’ll do a free assessment on your information and Irish records and see whether further items of interest can be found. If we find lots of information, great ! Then we’ll create a trail for you to follow or be guided, that’ll take you to the heart of your family’s origins in Ireland. If information cannot be found or verified, then that’s OK too – we’ll get to know you a little bit and then create a trail based on our experience, your thoughts and feelings about your family and places of heritage and common Irish ancestry. Come and find where it all began … whether you visit the homeplace or townland of your ancestors or whether you enjoy a more general experience, Ireland will dazzle you. Experience the land of your people and be assured of a warm welcome. My fathers name was Gerald Walter Power born 1928 in Corner Brook Newfoundland Canada. His father was named Redmond Power, not much is known about my grandfather, because he passes away when my dad was a little boy. I don’t have much information, only that the powers come from Waterford. My Great-grandfather James Power arrived in Argentina (to the Port of Buenos Aires) on February 15th 1889. His father was Thomas Power. According to what we know, he (James) might have been arrived in a boat named Dresden, from the Queenstown port (date unknown). He was born in Cardiff, Wales, although his family was most probably from Kilfane, Kilkenny. Thanks for anything you can find! My father was Louis Gene Power born in Lehi (now Mesa), AZ to James Oliver Power (Hannover, Kansas) 1878 and Sarah Laveda Bullock (Blanchard, Iowa) 1880 on August 28, 1924. He was the youngest of 13 children; two sets of twins. Louis G. Power’s grandfather, Robert Power was thought to be killed in the Oklahoma land rush and it is believed that he came to the United States during the potato famine in Ireland. Robert Power never returned home and therefore, declared deceased seven years after his departure from home which was either Kansas or Missouri. Many documents which were handwritten,such as birth and death certificates spell POWERS, but all insist it should have been POWER.